"Can I show you my trick?" Aron Ralston asked television talk-show host David Letterman, then rotated the wrist of his new prosthetic limb 360 degrees while holding a coffee mug. In a story told around the globe, Ralston (E'97) had fought fate and come out on top. An experienced climber and outdoorsman, Ralston went hiking alone down Utah's Bluejohn Canyon on April 26. As he climbed over a boulder, it shifted, pinning his right arm against a canyon wall. Five days later, after having tried fruitlessly to budge the 800-pound rock, he broke the bones in his forearm and amputated his arm below the elbow with a dull pocketknife. The operation took about an hour. Once free, he rappelled down a 60-foot cliff and walked five miles before finding help. News of his feat caught the attention of Ralston's former classmates, who, in true Carnegie Mellon fashion, took to the Internet to share updates. Ralston's poise and bravery under dire circumstances didn't shock those who were close to him in school. "His story is amazing, but not surprising. If anyone could do what he did and handle it as gracefully, it would be Ralston," said friend Chris Adukaitis (E'97) of Springfield, Va.
Less than 48 hours after Ralston was transferred to a Colorado hospital, his Aspen, Colo., roommate, Elliott Larson, wrote in an email that Ralston was "eating as much solid food as [the hospital staff would] let him." Classmates who had accompanied the slender, champion muncher on countless late-night runs to Ritter's Diner on Baum Boulevard breathed a sigh of relief. Ralston was already an avid outdoorsman when he came to Pittsburgh in 1993. A double major in mechanical engineering and French, he was an articulate scholar and a member of the national engineering honor society Tau Beta Pi. Friends remember him as being constantly in motion: dancing, running, ducking into practice rooms in Porter Hall to play piano, conducting cafeteria food raids to appease his hunger and dreaming up mischief. To close out his sophomore year, he spearheaded a trip of his floormates to see the band Rustëd Root at what was then known as the Star Lake Amphitheater. Ralston continued to follow his favorite bands after graduation. Elias Fallon (E'97) recalls a time when Ralston spontaneously drove from New Mexico, where he then lived, to Phoenix, Ariz., for a Tenacious D concert. "I was standing by the sound board with my sister, and I look over and there's Ralston jacking in [to tape the show]. He looks at me and says 'Elias! ', comes over, gives me a hug and says, 'I was hoping I'd run into you here. I couldn't find your number and I need a place to stay tonight.'" Ralston's passion for outdoor photography in extreme conditions grew over the past two years, friends say. Photos he had taken himself circulated on the Associated Press wire after his story broke. But it is his smilethe same one he flashed as he stepped into his first press conference on May 8, taking pictures of the crowd with a look of genuine disbelief on his facethat is the signature of his true demeanor: friendly and open to what the world has to offer. When old college friends would get together and talk, stories of Ralston and his adventures would surface even when he wasn't there. "The thing was that he never lost the sense of himself," friend Jay "Benny" Blanco (E'98) of Columbia, Md., said. "He was the same guy who I met in Hamerschlag [House] our freshman year for all four years of college. He wasn't selfish. He wasn't egocentric. He never said a bad word about anyone. He brought life to us all." Ralston's love of the outdoors led him to leave his job as a mechanical engineer at Intel and return to Colorado to do more hiking and climbing. "That's Ralston," Blanco said. "Whenever you think about him, you just have to smile or laugh. He does the things that you wish you could do someday, but he didn't just think it. He did it. He's 100 percent energy." Before his fateful trip to Utah, Ralston had reached the summits of 111 of the 119 tallest peaks in Colorado, many of them by himself, and in winter, according to his Web site, www.geocities.com/aronralston. Along with Ralston's sense of adventure came a bit of recklessness. A story appeared in the Denver Post April 28, two days after Ralston became trapped, describing how he and two skiing companions had escaped death earlier that year when they were caught in an avalanche. Ralston has apologized for not telling anyone he was going canyoneering in Utah, a mistake that caused his parents and friends a lot of worry. A search for him began after he failed to show up for work at Ute Mountaineer, an outdoor gear shop in Aspen. The outpouring of support that followed Ralston's ordeal included a benefit concert by one of his favorite bands, The String Cheese Incident, to help pay his medical expenses, and a flood of flowers, food, cards, letters and photos from his fellow alumni. "I received a card from the east coast and one from the west coast that had each traveled hundreds of miles collecting kind thoughts and signatures from fellow alumni before being mailed to me," Ralston wrote in a July 2 letter to the Carnegie Mellon University Alumni Association. He thanked the association and Alumni Relations Office for sending him an afghan featuring campus buildings, which he displayed in the family room of his parents' house in Centennial, Colo., where he stayed while recovering. Ralston keeps his loss in perspective. A hand and forearm are not a life. He has already returned to mountain climbing and plans to take up adventure racing, a team event featuring sea kayaking, mountain biking, whitewater canoeing, trail running, in-line skating and swimming. Although besieged by media requests, he has given only a few select interviews and declined requests from Carnegie Mellon Magazine. His speaking fee is $20,000 to $25,000, according to the Nationwide Speakers Bureau in Beverly Hills, Calif., which books his appearances. But his first talk after his accident was at his former middle school in Greenwood Village, Colo., where he told students they should always let a responsible person know where they're hiking and make sure they carry a sharp knife, AP reported. Documentaries of his saga are in the works, and Ralston is writing a book for a publisher he declined to name. 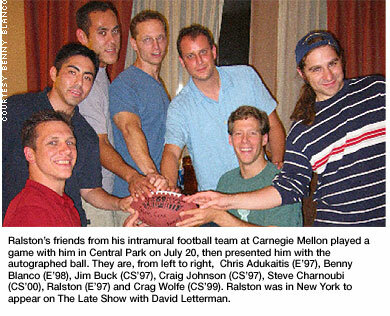 When Ralston went to New York City to tape his appearance on The Late Show with David Letterman July 21, he invited several friends from his Carnegie Mellon days to spend the weekend in the city with him. They traveled from California, Colorado, Washington, D.C., and Boston to join him and ended up playing a game of football in Central Park. "He was typical Ralston. He hasn't changed," Jim Buck (CS'97) of San Jose, Calif., said. Ralston's friends walked away with a greater appreciation of life, Blanco wrote in an email afterwards. "I tell you I definitely took something away from seeing him again.... I want to live a fuller life and be a better person." Jessica Strelitz is a writer and editor living in Arlington, Va.